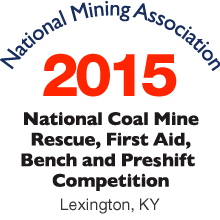 The National Mining Association (NMA) was pleased to be the sponsor of the 2015 National Coal Mine Rescue, First Aid, Bench and Preshift Competition from September 14-17, at Lexington Convention Center, Lexington, Ky. Mine rescue teams and individuals from coal companies throughout the United States compete to validate the effectiveness of teams training regimes and to ensure their readiness in the event they are called upon to aid in the rescue of industry colleagues. The four-day competition included team competitions for Mine Rescue and First Aid and individual competitions for Bench and Preshift as well as exhibits from companies and suppliers of coal mining equipment and services. The 2015 competition had 65 teams with approximately 600 people participating in the team or individual competitions. Teams were from Alabama, Colorado, Illinois, Indiana, Kentucky, New Mexico, Ohio, Pennsylvania, Utah, Virginia, West Virginia and Wyoming. For a complete list of winners, click here. For a list of all the results, click here. For a schedule of events, click here. NMA thanks the companies that exhibited at the competition. A list of the exhibitors and information on each company can be found here. The National Mining Association (NMA) is U.S. mining’s advocate in Washington, D.C. and beyond. NMA’s mission is to build support for public policies that will help Americans fully and responsibly benefit from our abundant domestic coal and mineral resources. Our objective is to engage in and influence the public process on the most significant and timely issues that impact mining’s ability to safely and sustainably locate, permit, mine, transport and utilize the nation’s vast resources. CORESafety®, Committed to Excellence in Mining Safety, is the National Mining Association’s (NMA) common safety and health framework that relies on a management system approach to improve safety and health performance at mining operations. The initiative, including leadership and culture, is based on critical organizational competencies that are managed through a mining-specific management system with three broad action directives: lead, manage and assurance. All Contents ©2015 NMA. All Rights Reserved.